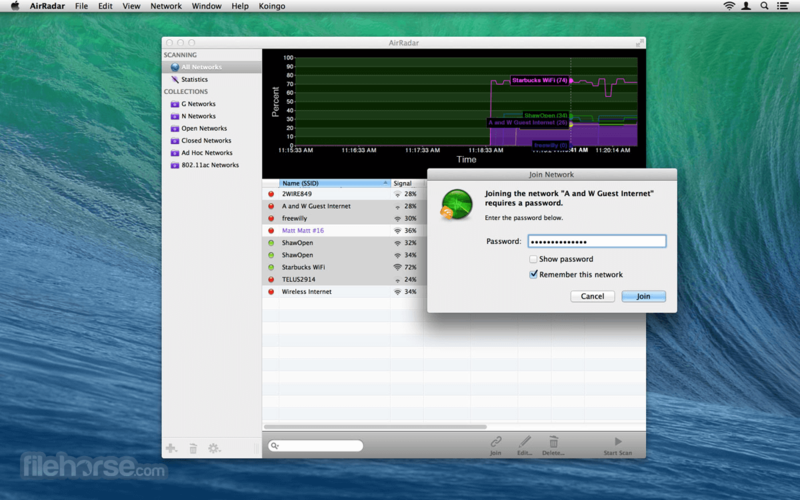 With AirRadar for Mac, scanning for wireless networks is now easier and more personalized! It allows you to scan for open networks and tag them as favourites or filter them out. 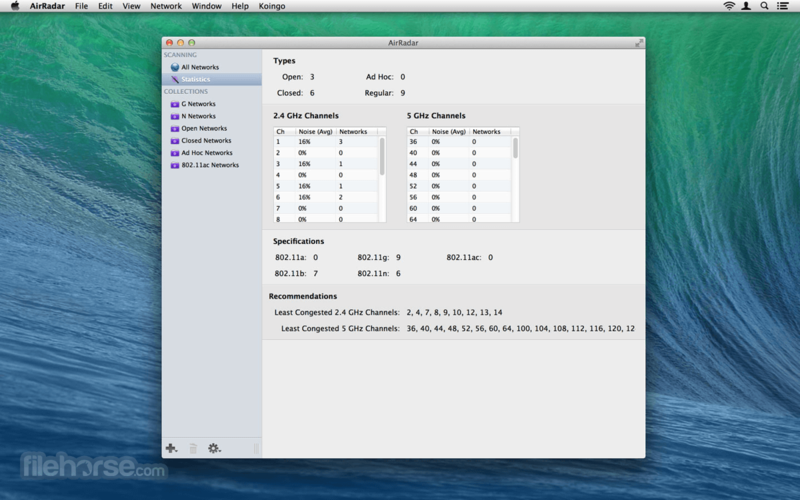 View detailed network information, graph network signal strength, and automatically join the best open network in range. Whether you are driving around looking for wireless networks, stuck in traffic, sitting on the beach, or if you are curious how strong your wireless signal is at home, AirRadar for Mac provides a more linear approach to network hunting. Setup a scan frequency, and have new open or closed networks have their name spoken, play alerts, or display notifications. Various other options allow you to customize your network list further, including assigning colors to best open networks and sound cues. Download it today, and take the hardship out of getting an Internet connection at a critical time. Supports all modern WiFi networks such as 802.11a/b/g/n/ac, and has expandability for future types. Identifies the best location of a network's signal and places it on a map. Locations are updated as better signals are found. Automatically join the best network when it comes into range. Keep your eyes on the road. AirRadar can speak new network names, and play alert sounds. Also, it sports full integration with Mac OS X's Notification Center. Networks are optionally remembered in the system's WiFi Keychain. Whether you're using the built-in system WiFi menu or AirRadar, all of your passwords are ready when you need them. 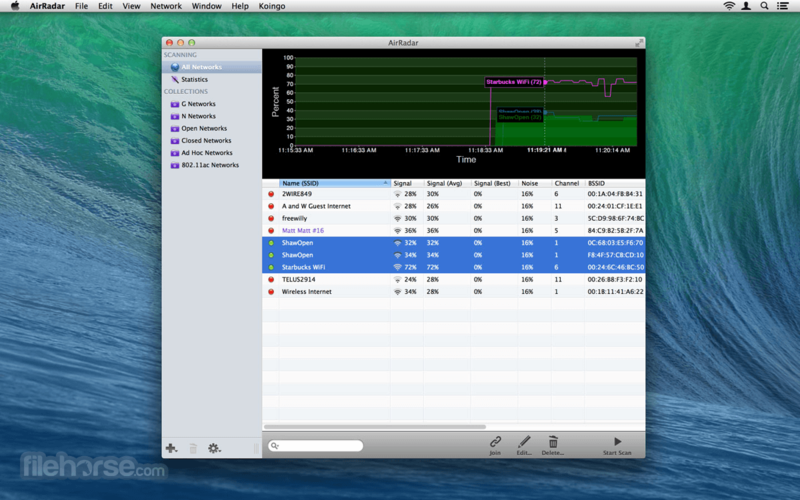 AirRadar for Mac reports much more than simply signal strength and a network name. View incredibly detailed information including encryption types, beacon intervals, vendor, channel bands, spec, and more!